Chateau d’If, made famous by Alexandre Dumas’ 19th century novel, The Count of Monte Cristo. The book’s story was fictional but the fortress has been used as a prison. 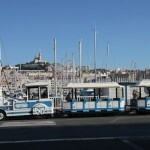 MARSEILLE, France — Our tour guide arrived 40 minutes late for morning sightseeing here in France’s oldest (2,600 years) and second-largest city. He quickly explained himself: He was badly hung over after having spent the previous evening drinking toasts to the world’s largest cargo ship, which had pulled out of Marseille the previous afternoon. My group (travel writers and travel agents) had been sharing toasts, as well, but we celebrated, among other things, new passenger services, meaning XL Airways’ launch of nonstop flights between New York and Marseille. I have never toasted a cargo ship (though I acknowledge such vessels are very important), and we were disarmed by our guide’s frankness. The M Pavilion, at right, a temporary building providing tourist assistance, including information and booking services associated with Marseille’s year (2013) as Europe’s culture capital. The InterContinental Marseille-Hotel Dieu is visible in the background. 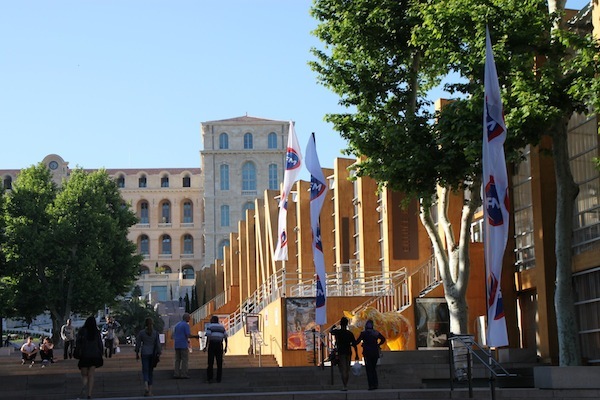 Headache or not, over the next few hours, Mika provided a window on a city that has been in transition for nearly 20 years, a process that hit a crescendo in 2013 with the opening of key new museums and Marseille’s position as Europe’s culture capital. 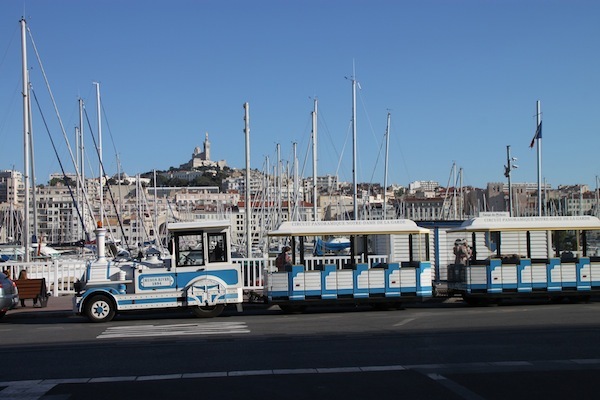 One of the several trains that take tourists on sightseeing rides in downtown Marseille. It wasn’t tourist friendly either. He said that when the first tourist trains passed through the Panier historic district, locals tossed eggs and tomatoes at them.